Herbs add something special to our dishes- a punch of flavor or a subtle suggestion of something exotic. But they do more than flavor. For centuries, culinary herbs have been used for medicinal purposes as well- for their antibiotic and antifungal properties, for their abilities to aid our respiratory and digestive systems among other things. Join me for a class on all things herbs! We will discuss the characteristics of common and some uncommon herbs, their benefits and their uses. 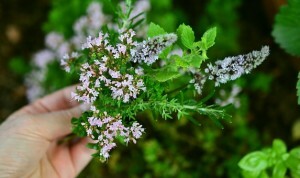 Most of us use basil, thyme, oregano, sage, etc. in our cooking, but do you use some of the more obscure herbs like lemon balm, shiso, lemon verbena or tulsi?